Red wattle hogs will be ready for market July-Sept. We still have a few whole and half hogs available. Reserve now. Love the farm? No time to garden? Become a Merry Gardener! Find out more about our farm work exchange and join us. READY 2019! Look for fresh organic veggies delivered in the Bemidji area each week in 2019. Order here. Eat fresh from the farm each week with our CSA and Farm2U options! Use Farm2U to place an individual order, or make it easy to eat right from the garden all summer long with our 16 week CSA membership. Delivery is to the Bemidji area weekly. Check out your farm fresh options here. Quantity orders for grocery stores, restaurants, schools, and other food service organizations. A large variety of USDA certified organic vegetables are grown at Merry Gardens Farm. We sell direct to restaurants, wholesalers, and other food service entities. Let us grow for you! Choose from our current product list, or talk with us about your goals. We can help produce what it is you need to delight your customers with fresh, organic, local options. The Kobe beef of the pork world. 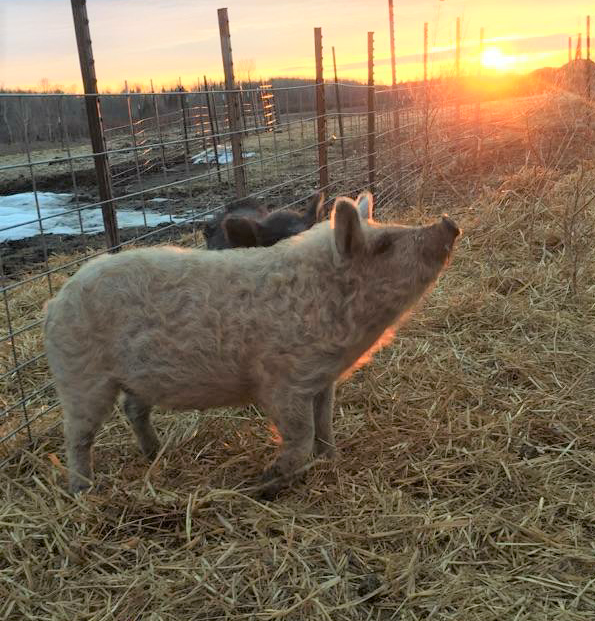 Two heritage breeds are raised on Merry Gardens Farm: red wattle and mangalitsa. Considered culinary meats favored by chefs across the country, our hogs are pastured from crops on the farm. Pork is available for purchase as a whole or half hog late spring and early fall. Reserve your hog now, they go fast! Individual cuts are also available as supplies last. Check out our current inventory of pork products here.